The price of oil and gas may continually fluctuate for the consumer or investor, but the job opportunities are plentiful given the fact that oil and gas are essential commodities consumed on a daily basis. For all practical purposes, renewable energy is in its infancy, and while engineers are drawn to the benefits of a career in this field, providing staffing opportunities in the oil and gas sector can be a lucrative endeavor. Sourcing and retaining experienced workers is not always easy for many businesses in the oil and gas industry. Schlumberger Business Consulting conducts many reports related to oil and gas, and has a plethora of articles concerning the strategic importance of talent. One article in particular examines how strategically important talent is to corporate industry growth. It references how oil spikes and price collapses have created a demographical gap in the oil and gas workforce. Rising prices encourage students to study and gain jobs in the field, while price collapses coupled with industry downsizing can divert college talent to other professions. The average age of employees in the industry, according to SBC, falls in the late 40’s to early 50’s range. In the new landscape, the industry is attracting more females, and demand for graduates is increasing, giving rise to plenty of opportunities in this sector in the staffing industry and for individuals searching for employment in this field. Companies are seeking workers with expertise in a range of specialties, from roustabouts, who perform maintenance in the oil fields, to project managers and experienced engineers. 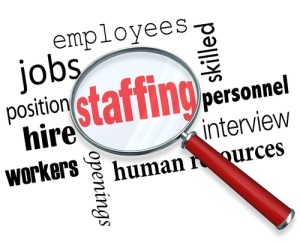 If, for example, your staffing company specializes in offshore roustabout jobs in oil and gas, there are plenty of companies searching, and a growing number of individuals looking for work. Providing benefits above and beyond those of your competition may encourage job hunters to use a staffing agency to land the perfect job. Specialist oil and gas recruitment and staffing companies will have a strong sense of what talent is needed, and what training is available. Maintaining a database means the ability to find local talent fast. Make sure you have a deep understanding of the needs of your customers, and that you can source the correct positions quickly. It may help to have job listings posted online. Many temporary positions, especially for roustabouts, may require travel and involve being away from home for extended periods. In order to attract the best individuals to these entry-level positions, it helps to make the physically demanding nature of the role extremely clear, and offer benefits, such as providing a personal account manager to regularly check up on staff and ensure their wellbeing, as well as help with resumes to help find a new position once the contract runs out. In terms of attracting companies that need to fill vacancies, make it clear you can take on HR responsibilities, offer complete background checks, conduct drug screening, and negotiate contracts. It is important to make sure that paychecks are deposited promptly so employees can focus on the challenges their roles present and not worry about being paid on time. If cash flow is a problem for your temporary staffing agency, you may want to consider factoring your accounts receivable. This alternative form of commercial financing involves selling your completed work invoices for immediate cash, which can be used to help meet your payroll obligations. Bay View Funding offers a valuable added service, known as Payroll Advance, allowing you earlier access to your cash for payroll each week. They also specialize in alternative commercial funding for the oil and gas industry.